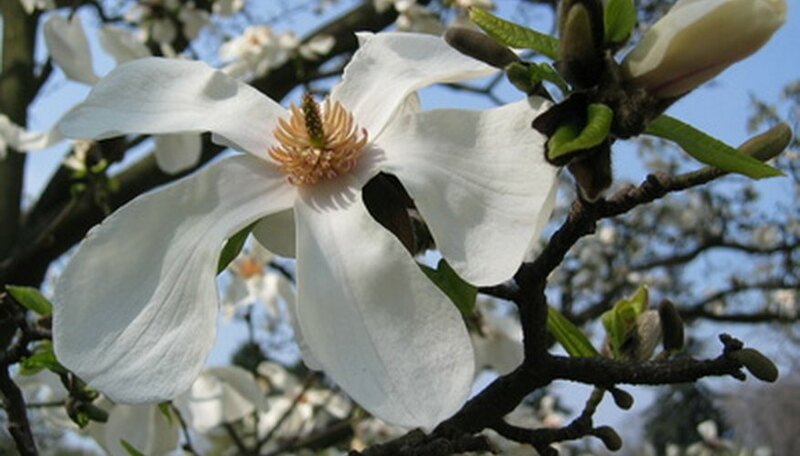 Bugs that kill magnolia trees often attack trees in large infestations, causing severe damage and death. Magnolia trees under attack by bugs display visible symptoms that allow you to recognize the problem before severe illness occurs. As a chemical control, apply an insecticide such as horticultural oil or insecticidal soap to control bug infestations. If a fungal infection is present, apply a general fungicide. Calico scales (Eulecanium cerasorum) are bugs that kill magnolia trees. These pests have black and white markings (that turn dark brown with age) and measure 6 to 8 mm in diameter. Infestations of calico scales cause extreme production of honeydew (a release of a liquid from the plant) that creates a prime environment for the fungal infection of sooty mold. Sooty mold is a black mold material that can be easily rubbed off of the surface of leaves. Symptoms of calico scale infestation include stunted leaves, yellowing of leaves, and leaf drop. For biological management of calico scales, parasitic wasps Prospaltella sp. and Physcus varicornis offer effective control. Tuliptree scales (Tourneyella liriodendri) also kill magnolia trees. Tuliptree scales are large, convex bugs that appear orange with black mottling; after dying, tuliptree scales turn brown and may remain on the tree for one to two years. This pest measures 6 to 12 mm in length. Tuliptree scales damage magnolia trees by causing a large production of honeydew and subsequent sooty mold. Symptoms of infestation include yellowing leaves, leaf drop, and die-back of branches. Twospotted spider mites (Tetranychus urticae) are bugs that kill magnolia trees. Mature mites are oval-shaped, have eight legs, and appear green-yellow with a black spot on either side during the growing season; overwintering females or mature mites that are not feeding display a red-orange hue. Twospotted spider mites measure approximately 1/2 mm in length and are active when the summer season temperatures become high. These spider mites damage magnolia trees by removing plant juices through feeding, leading to leaf drop and eventual death, according to the University of Minnesota Extension Service. Also, symptoms include white or yellow dots on leaves. To rid your magnolia of an infestation with a biological method, consider using natural predators like lady beetles or rove beetles.